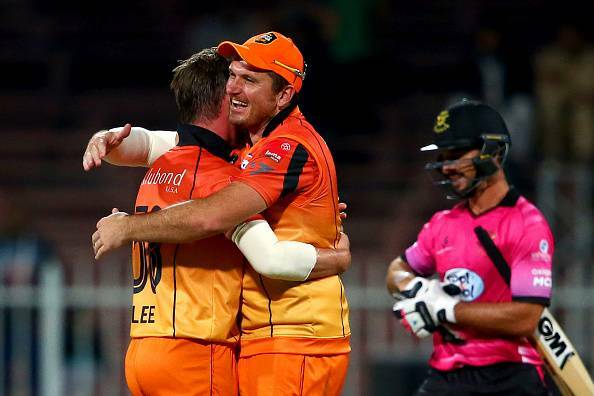 Virgo Super Kings skipper Graeme Smith led from the front with a 42-ball 57 to help his side register their first win in the inaugural edition of the MCL. Chasing the target of 169 set by the Kings, Libra Legends fell short by 5 runs despite a 102-run stand for the opening wicket. Though Smith bagged the MoM award, it was former Indian cricketer Murali Kartik’s miserly figures of 4-0-13-1 that proved the turning point in the match. The South African pair of Smith and Jacques Kallis faced off each other with both sides looking for their first win of the tournament. With the second leg of the tournament kicking off on a pitch that was tailor-made for the batsmen, Smith had no hesitation in choosing to bat after winning the toss. The former Proteas skipper made his intentions clear early on with a boundary and six in the very first over of the match. The next two overs fetched only as many runs with McKenzie taking much of the strike but he more than made up for the dot balls by smashing 17 runs in the fourth over, including two strikes over the fence. The pair managed 44 off the powerplay overs before veteran Australian Brad Hogg broke the partnership off his very first ball as McKenzie was left bamboozled by a clever leg break. Though it was a brief dip in the run-rate, Smith and the new batsman Owais Shah made sure to compensate for the same by smashing 30 runs in two overs to take the score to 88-1 after 11 overs before Hogg struck once again. Azhar Mahmood replaced Shah at the crease but Smith also departed soon after reaching his fifty, out caught and bowled by Ryan ten Doeschate. The South African had done his job by then and the rest of the damage was done initially the pair of Mahmood and Jacob Oram, before Hasan Raza and James Forster finished off the work with neat little cameos. It was a contrasting tale of fortune for Australian bowlers as Hogg ended with figures of 4-0-12-3 while fast bowler Andy Mckay gave away 50 runs off his four overs. Smith chose to open the bowling with Kartik, and the Legends’ opening pair of Kallis and Martin Lumb chose to play out the over cautiously before getting into their stride scoring 12 runs off the next over bowled by Brett Lee. Yet again the powerplay overs fetched 44 runs without the loss of any wicket and the way Kallis and Lumb were batting, the Legends looked on course for a victory as they reached the 100-run mark after 12 overs. Malinga Bandara provided the crucial breakthrough for Kings dismissing Lumb for a well-made 54 before the returning Kartik put a stranglehold on affairs with his tight bowling before picking up the key wicket of Kallis for 48. Ten Doeschate, who came in at No 3, played superbly remaining unbeaten on 42 off just 23 balls, but the likes of Sean Ervine and Taufeeq Umar failed to score when it mattered while also losing crucial deliveries that ultimately proved costly as Legends fell short of the target despite scoring 27 off the last two overs. Brief Scores: Virgo Super Kings 168/5 (Graeme Smith 57, Hogg 3/12) beat Libra Legends 163/4 (Martin Lumb 54, Jacques Kallis 48, Murali Kartik 1/13) by 5 runs.